MOGG born from the will of its creator, the architect Nicola Galbiati. With many years of experience in the world of furniture and design, the architect starts from where he had stopped. Artistic director but also able to frame everything in a pragmatic entrepreneurial vision, always with the commitment and the subtle transversal pleasure of looking ahead. Curious by nature, it is fascinating to understand, to anticipate. Research is the real engine of his work, then the skill and knowledge in the field complete his skills. Adelaide Wood is an earth ceiling shelf with Iroko solid wood structure, complete with 13 shelves. Prepared for ceiling mounting for a height from 230.5 cm to 311.5 cm depending on the terminal. Brass feet and screws. Dimensions: 55 x 55 x 230.5 to 311. 5 h cm For any information, contact customer service. 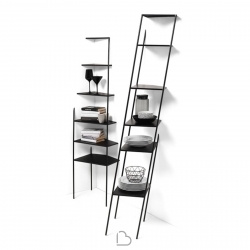 Adelaide Metal is a Mogg shelf in matt black painted metal complete with 13 shelves. Prepared for ceiling mounting from 230.5 to 311.5 cm depending on the terminal. Brass feet and screws. Dimensions: 55 x 55 x 230.5 to 311. 5 h cm For any information, contact customer service. 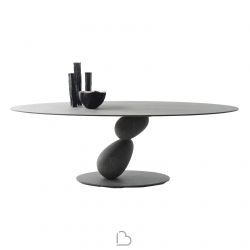 Matera is a round table with metal structure and MDF top. Everything is covered in hand-spaced, textured finishes: A urban gray | B river stone | C blue belgian marble. Dimensions: 220 x 110 x 75 h cm PLEASE NOTE: the irregularities of this finish are to be considered a quality and not a defect therefore they characterize every single table. 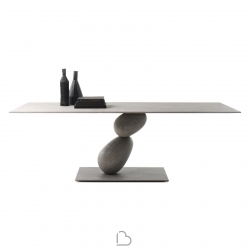 Matera is a new rectangular table of the Milan Furniture Fair 2019 with metal frame and MDF top. Everything is covered in hand-brushed textured finishes. Dimensions: 220 x 100 x 75 h cm PLEASE NOTE: the irregularities of this finish are to be considered a quality and not a defect therefore they characterize every single table. 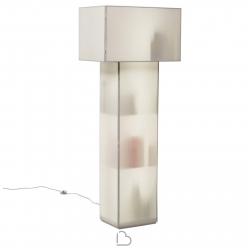 Velasca is a Mogg floor lamp designed by Dainelli Studio with LED light (56W - 3000K). With metal frame and shelves and cotton fabric lampshade coupled with white opal PVC, complete with 2 front doors. Dimensions: 78 x 55 x 167 h cm For any information, contact customer service. 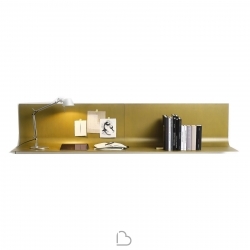 Sfoglia is a Mogg metal shelf designed by Bellavista, Piccini, a new addition to the wall-mounted 2019 furniture show in Milan. Available in 2 different burnished and patinated bronze finishes. Dimensions: 100 x 28 x 41 h cm Available desk of the same series. For any information, contact customer service. 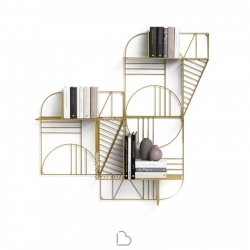 Sfoglia is a Mogg metal writing shelf designed by Bellavista, Piccini, a new addition to the wall-mounted 2019 furniture show in Milan. Available in 2 different burnished and patinated bronze finishes. 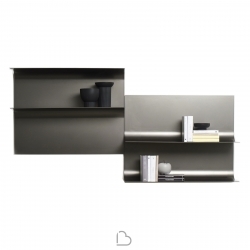 Dimensions: 100 x 42 x 41 h cm Available shelves of the same series. For any information, contact customer service. 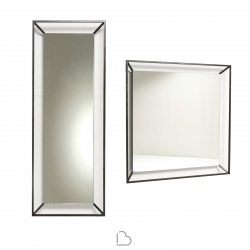 Timeless is a Mogg wall mirror with metal frame in etched iron finish. 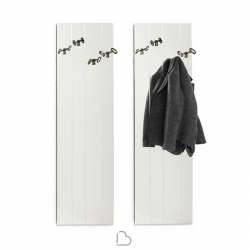 Made in the square and rectangular version that can be set up to be hung both vertically and horizontally. Dimensions: 150 x 16 x h 150 cm square / 75 x 16 x 250 h cm rectangular For any information, contact customer service. 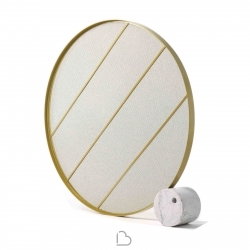 Swing is a metal screen with a matt gold finish. Available with Carrara marble base, Marquina black or terrazzo finish cement. The screen is in 16x8 mm stretch mesh. The base allows left or right rotation of the screen. Dimensions: 170 h x 7 cm / Base: 30 x 24 cm For any information, contact customer service. 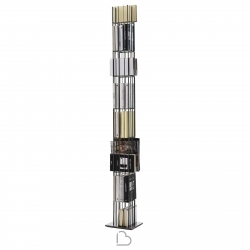 Metrica Tower is a self-supporting Mogg bookcase in burnished metal. 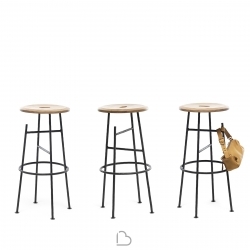 Created by Ctrlzak for the 2019 furniture fair. Ideal for furnishing the living area of your home or office with style. Dimensions: 25 x 25 x 191 h cm For any information, contact customer service. 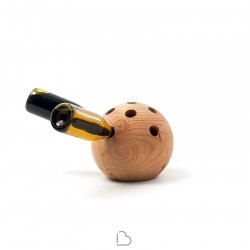 Bottle holder in natural cedar wood with ballast in original metal and contained in the measures. 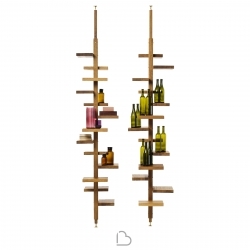 With a simply unique design, it will help you to have your favorite wine bottles on display and inserted in the living in an absolutely elegant way. - Contains up to 10 bottles. - Diameter: 23 cm For any information, contact customer service. Kit 4 keys Coat hanger in brass casting in black nickel finish. Dimension: 9 x 2 x 6h cm For any information, contact customer service. Wall mirror made by Luca Somaini with 4 hanger keys in brass casting. Size: 52 x 11 x 180h cm For any information, contact customer service. Wall hanger in brass casting with elements in two different sizes. The butterflies are available with copper or nickel finish. Dimensions: 5 x 4 x 5h cm | 8 x 6 x 8h cm For any information, contact customer service. Oval wall mirror with 5 coat hanger butterflies in mixed brass, mixed finishes (polished nickel, black nickel, oxidized brass). On request possibility of copper coat hanger butterflies. Dimensions: L.89 / P.9 / H 186 For any information, contact customer service. 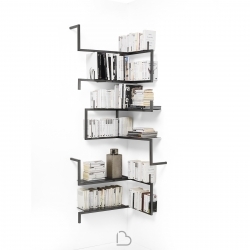 Shelves for Mogg Anthology bookcase in satin-finished metal, 2 mm thick, glossy lead finish or matt white varnish. The 19.2 cm deep shelf is suitable for both 10 cm deep and 20 cm deep modules. The 43 cm shelf is suitable for FG modules. The shelves must be positioned and fixed on the wall cross bars. For any information, contact customer service. Kit of 3 bookends in satin-finished metal, glossy lead finish or matt white painted, which can be used in all the modules. Dimensions: 3 x 10 x 10 h cm For any information, contact customer service. Angular D module that allows you to compose Mogg Anthologia. 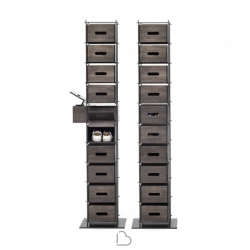 Composed of metal tubular structure, it is available in 2 different colors. Dimensions: 80/65 x 10/22 x 74 h cm For any information, contact customer service. Mensola a parete mogg in metallo disponibile in 2 finiture verniciata oro oppure nero. Musa è un insieme di linee metalliche creano piani, circoscrivono nicchie, determinano and perimetro intorno agli oggetti. Dimensioni: 60.5 x 26 x 60.5 h cm Per qualsiasi informazione, contatta il servizio clienti. Exagon is a self-supporting container furniture Mogg designed by Claudio Bitetti with hexagonal base in lacquered MDF in all the colors from the sample. Complete with internal glass door. 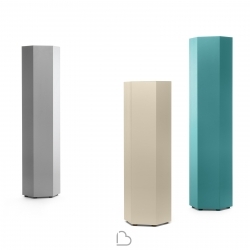 Available in 2 sizes: Exagon 160: 55 x 48 x 160 h cmExagon 215: 55 x 48 x 215 h cm For any information, contact customer service. 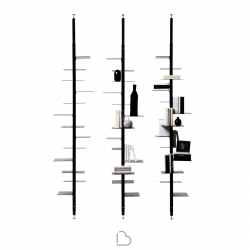 Mamà di Mogg is a wall-mounted metal bookcase available in 3 sizes in angular and wall versions and two colors: white and black. Mama Big: 76 x 46.5 x 226 h cmMamà Small: 61 x 40.5 x 166 h cmMamà Wall: 45.5 x 61 x 186 h cm For any information, contact customer service. Manolo made by Idelfonso Colombo for Mogg is a shoe cabinet with burnished metal structure and drawers in solid moka ash. A new concept of stylish and functional shoe rack. Size: 40 x 40 182.5 h cm For any information, contact customer service. Stool with black rope seat with curved rod frame and black powder varnish. 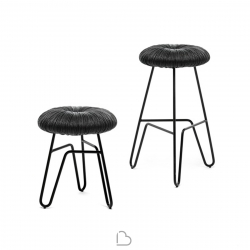 Available in 2 size: 43h cm | 65h cm The MDN12OC Pouf is also part of the Donut All Black family For any information, contact customer service. Mogg stool with wrought iron structure and seat in solid Canaletto Walnut. An imperfect cut of a leg is transformed into a function that is as simple as it is useful. A hook for bags and clothes makes us hands free to communicate with gestures. Size: 35 | h 75 cm For any information contact customer service.